What’s the Price for the 2019 Honda Pilot? How Many MPG Does the 2019 Honda Pilot Get? What’s New for the 2019 Honda Pilot? Debuting for the 2003 model year, the Honda Pilot has since been one of the automotive world’s most celebrated and popular mid size crossover SUVs. And that is due to its robust powertrains, respectable handling, loads of interior room, and people- and cargo-hauling practicality. Currently, in its third generation of production, the Pilot got a facelift for 2019 in the form of revised cosmetics and added features. The trims, though, are still the LX, EX, EX-L, Touring, and Elite. Powering the mid-size crossover is a 3.5-liter, 24-valve V6 with 280 horsepower and 262 lb-ft of torque. On the LX, EX, and EX-L, the engine is paired with a 6-speed automatic transmission. The upper-level Touring and Elite go with a 9-speed automatic gearbox with paddle shifters, and they enjoy the addition of idle-stop technology for the engine. You have the choice between the front-wheel-drive (FWD), and all-wheel drive (AWD) on all trims save for the top-level Elite, on which AWD is standard. Go with any trim above the LX, and Honda will add an intelligent traction management system that optimizes driving in snow if with FWD and also maximizes performance in sand and mud if AWD. With its three rows, the 2019 Pilot can accommodate up to eight people. The Elite, though, swaps the second-row bench-style seat with a pair of captain’s chairs to reduce the maximum occupancy to seven. (This is optional on the Touring.) For comfort and convenience, the standard features include push-button engine start, a 5-inch color LCD screen, a USB port and audio jack for connecting mobile devices, a USB charging-only port, Bluetooth®1 wireless technology for hands-free phone calling and audio streaming, and seven-speaker 215-watt sound. Upper-level enhancements or additions include remote engine start, heated or heated and ventilated seats, leather upholstery, steering-wheel heating ability, front-seat power adjustability, a two-position memory system for the driver’s seat and side mirrors, tri-zone automatic control, a garage-door opener, an automatic-dimming rearview mirror, an 8-inch display screen, HondaLink®2 for remote connectivity, HD Radio™, Apple CarPlay™3 and Android Auto™4 for smartphone integration, hands-free text messaging, a trial subscription to SiriusXM® Radio, a navigation system, and a 10-speaker 590-watt premium audio system. New for 2019 is CabinControl™, which is standard on all trims but the LX and turns your smartphone into a remote control for all your infotainment functions. Also new for this model year are the CabinTalk™ in-car PA system (on the EX-L and higher), and a 4G LTE Wi-Fi hotspot and a 10.2-inch-screen entertainment system with a Blu-ray player (on the Touring and Elite). The Elite is the only model with wireless phone charging capability. For restraint or cushioning in the event of a crash, the 2019 Honda Pilot is furnished with dual front impact airbags, front seat-mounted side-impact airbags, and a pair of side curtain airbags that flank all three rows. Other standard safety features include automatic high beams, LED daytime running lights, a multi-angle rearview camera, ABS, vehicle stability assist with traction control, and hill start assist. Honda Sensing®—a driver-assist technology package that combines lane keep assist, lane departure warning, forward collision braking, adaptive cruise control, road departure mitigation, collision mitigation braking—is now standard on all trims. 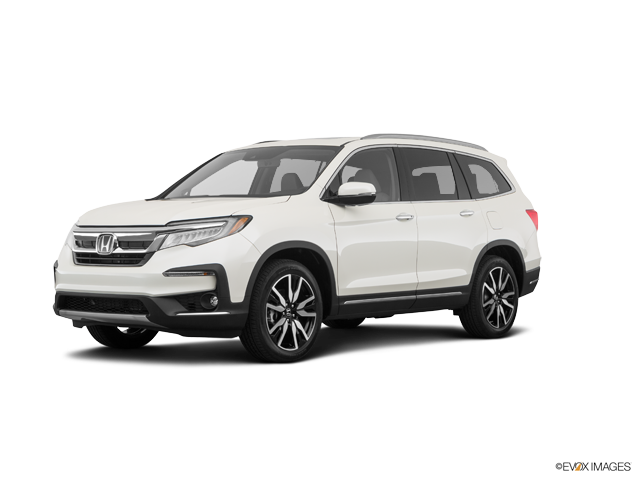 Give us a call today at our dealership in Michigan City, Indiana, to set up a test drive of the 2019 Honda Pilot and speak with one of our Honda specialists. * MSRP excluding tax, license, registration, $995.00 destination charge and options. Dealers set own prices. MSRP of $31,450 is for a 2019 Honda Pilot LX. Model shown is a 2019 Honda Pilot Touring, which has an MSRP of $42,520. ** 19 city/27 highway/22 combined mpg rating for 2WD 6AT models. 18 city/26 highway/21 combined mpg rating for AWD 6AT models. 20 city/27 highway/23 combined mpg rating for 2WD 9AT models. 19 city/26 highway/22 combined mpg rating for AWD 9AT models. Based on 2019 EPA mileage ratings. Use for comparison purposes only. Your mileage will vary depending on how you drive and maintain your vehicle, driving conditions and other factors. 1 The Bluetooth® word mark and logos are owned by the Bluetooth SIG, Inc.
2 Check the HondaLink® website for smartphone compatibility. 3 Apple CarPlay is a trademark of Apple Inc.
4 Android and Android Auto are trademarks of Google Inc.